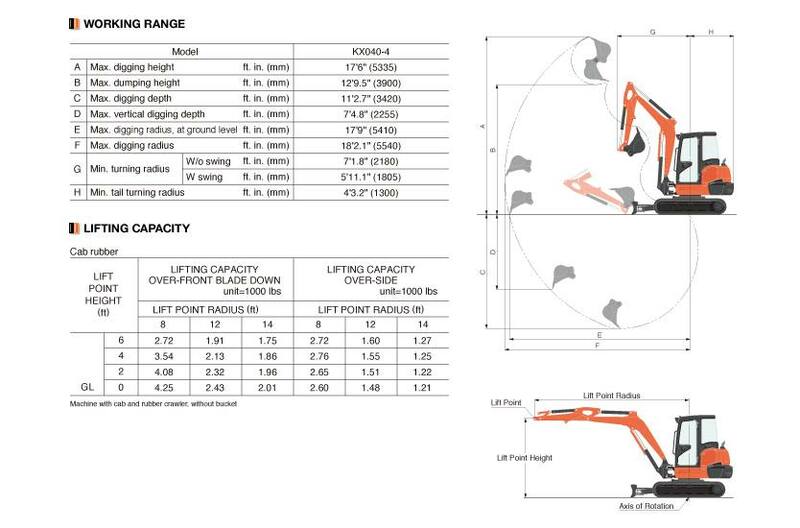 KX040-4R3AP comes with a 24" 4.25 CU. FT. Trenching Bucket and a Quick Coupler. This machine was placed in our rent to sell fleet, but has recently been returned. Qualifies for 0% financing and full factory warranty. Common Rail System and Diesel Particulate Filter (DPF) Muffler: The Common Rail System (CRS) electronically controls the fuel injection timing and amount in stages rather than all at once for optimal combustion. The results are greater efficiency, better fuel economy and less engine noise. Its combination with the Exhaust Gas Recirculation (EGR) and Diesel Particulate Filter (DPF) Muffler reduces harmful emissions to make the KX040-4 Tier IV-compliant. 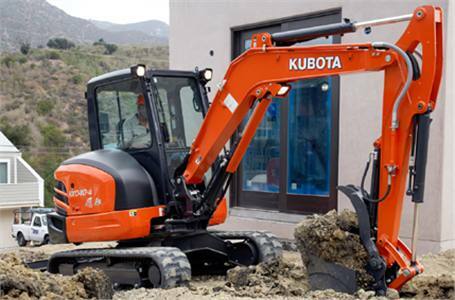 Automatic regeneration system: Kubota’s original automatic regeneration system automatically burns accumulated particulate matter (soot) in the DPF muffler to keep the muffler clean for longer operation. For safety reasons, automatic regeneration can be turned off with the inhibit switch when the excavator is operating in areas that are prone to fires. Spacious Cab: Designed for greater comfort, the large cab with a fully flat floor provides more legroom to minimize fatigue. Wider Entrance: The KX040-4’s larger cab provides a much wider door and more ample foot space, to make getting on and off the excavator a breeze. 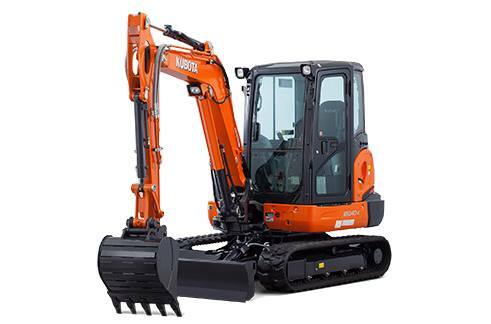 Deluxe Suspension Seat: Kubota’s high-back suspension seat has been designed for maximum operator comfort and to minimize fatigue during extended machine operation. The deluxe reclining seat offers weight compensation, firm adjustable wrist support and retractable seat belts. Fully Flat Floor: For added comfort, the cabin floor is completely flat for greater legroom and a more spacious feel. Proportional flow control of auxiliary circuit (AUX1/2) and maximum oil flow setting: The KX040-4 is available with a standard AUX1 and optional AUX2 auxiliary circuits. The convenient thumb-operated switch on the lever allows easy proportional flow control of the auxiliary circuit, while a forefinger-operated on/off switch enables simple operation of special applications that require a constant oil flow. The maximum oil flow setting is conveniently adjustable from the digital panel. Up to five flow rates corresponding to specific attachments can be programmed in the memory on the digital panel for easy retrieval for the next job. AUX1 Diverter Valve: With the AUX1 diverter valve, the AUX oil supply can be changed without having to remove the thumb pipeline when the operator wants to use a hydraulic attachment. Tilt Blade Control: The 6-in-1 blade is a true productivity enhancer, and operation is now even more rewarding. Blade up, down, and float functions are the same as the previous model. Operate the rocker switch on top of the blade control to tilt the blade 10° up or down, and simply twist the control handle to angle the blade 25° left or right. 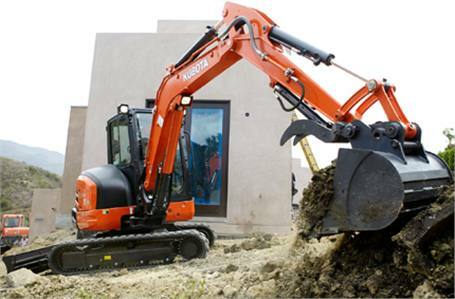 Command all six functions simultaneously for more convenient control of landscaping, shaping, and backfilling jobs. Superior Width and Tilt Angle: This 5’ 10.9”-wide blade stretches across the entire machine width, even when tilted. It can be tilted a generous 10 degrees right or left, allowing the operator to dig ditches easily when tilted on a flat surface. Bolt-On cutting Edge (BOE): The cutting edge protects the angle and 6-in-1 blade during heavy-duty dozing operations. The reversible cutting edge is divided into two sections to easily invert the edge for continued use. Tie-down/Lift Points: The dozer blade’s thick side plates improve the tie-down point’s durability. Use them also as lifting points, along with the lifting point on top of the boom, for convenient 3-point crane lifting of the KX040-4. Dual element air filter: Excavators often operate in dusty conditions. To maintain outstanding engine durability, dual element air filters help ensure that only clean air enters the engine. ROPS/OPG (Top Guard, level I) Canopy and Cabin: The OSHA-certified ROPS/OPG (Top Guard, level I) canopy and cabin provide protection in the event of accidental rollovers and falling objects.